Serena Dougan and Lily Kanter founded Serena and Lily after deciding that they wanted to provide something different for the home owners of California. Lily used to own a baby boutique and Serena used to work for Microsoft, giving them enough experience to get the venture off the ground. During their first meeting, they decided within the hour that they would create a whole new business idea that focussed on home decor for children and their parents. After experiencing such an incredible response from their customers, the pair decided to expand the business and start designing products for the rest of the home. This led to furniture, bedding, rugs and even outdoor equipment. Nowadays, you can shop at Serena & Lily either online or by visiting either of their two stores – Hamptons Beach Market and San Francisco Design Shop. Enjoy this summer in style this year with some of the most beautiful outdoor furniture products available. 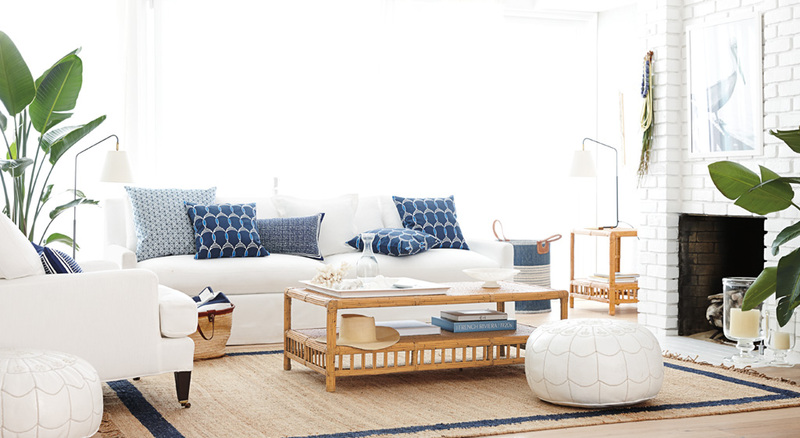 Whether you're simply looking for some new beach towels or outdoor rugs or you want to completely renovate your back yard and buy some new outdoor chairs, there’s something for you here. Serena and Lily haven’t lost sight of their original business plan, which is why they have a whole section dedicated to baby items and furniture. This is the perfect place to shop if you’re expected a new baby or have plans to redecorate your child’s bedroom. If you’re looking for inspiration, the ‘Art’ section is a brilliant place to have a look around, and you can purchase some beautiful items too. Serena & Lilly now also stock fashion clothing for women, including dresses, sleepwear, beach & swimwear, and accessories like jewelry, pareos, and more. Make shopping a whole lot better by checking Coupofy for the latest coupon codes before you shop. 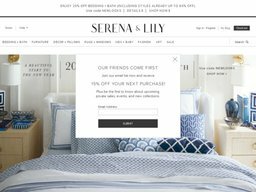 It’s easy and quick to use, and the coupon codes will take you directly to Serena & Lily, where you can use them to save money on your order. Serena and Lilly accept all common types of credit card for payment, including American Express, Mastercard, and Visa, as well as their own branded gift cards, which can be redeemed for all or part of your order. Serena and Lilly currently only ship to the US (including Alaska & Hawaii) and Canada, excluding all other countries and US territories. Shipping is charged based on the value of your order, with all orders under $6 shipping for free. Ground delivery starts at $6 for orders over $6, and can reach as high as $124 for orders between $2,000 and $3,000. Anything over this amount is charged at 4% of the total. You can also pay extra for 2nd Day Rush Shipping, which starts at $15 for orders under $6. For Canadian orders please add your items to the basket to get an accurate calculation of the shipping cost. You have 30 days after your purchase to return the items if you’re not happy with them. You will be sent a packing slip with your item, and you can easily return your order by filling out the slip and posted it to the given address. Custom orders can be cancelled within 24 hours after submitting them, so if you change your mind, you don’t have to worry about losing your money.